Greece’s Deepsessions Recordings returns this week with their 212th overall release and a new EP from AtmoNoise. 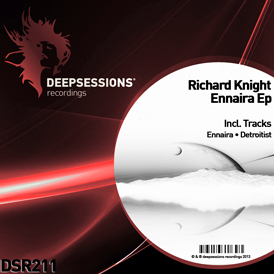 This is the Greek producer’s debut on Deepsessions which follows a three track EP on Remmiz Recordings from June of 2012. AtmoNoise’s new EP is entitled ‘Infamous’ and it comes with two brand new original productions. Those of you that loved AtmoNoise’s up-tempo style from his Remmiz release are in for a real treat here as the title cut comes with a wicked progressive energy. Razor sharp synths lines, vibrant stabs and squelchy electronics paint a lovely old school sounding vibe. The chord changes add a nice emotional element and deliver a high intensity peak which the trancier progressive floors are going to love. The companion piece ‘Lulu Road’ proves to be a great complement as it comes with a much groovier crossover vibe. Quirky synth lines, soft rhythmic stabs and a tight groove make this one sure fire dance floor material. Solid EP from AtmoNoise who we look forward to hearing more from in the near future.